Recently here on Thrasher's Wheat, we have been re-visiting and reassessing some of Neil Young's 1980's releases on Geffen Records, such as, TRANS: A Little Bit of Essential Neil Young and "Landing on Water" by Neil Young: Incredibly Underrated. And lots of fascinating observations by our dear TW readers in post comments. Neil Young's Life (1987) is another overlooked album with many transcendent moments such as, "Long Walk Home" and "When Your Lonely Heart Breaks." As you may recall, David Geffen in the 1980's filed a $3 million lawsuit against Neil Young for violating his contract by recording ‘unrepresentative’ albums. In other words, Neil Young wasn’t making Neil Young music. "The truth is I fought with him because I wanted him to do better work,'' Mr. Geffen explained afterward. ''I was taking too much of a fatherly role in his life.'' Only David Geffen could describe a lawsuit against one of his trophy clients as an excess of paternalism. Described by friends, peers and adversaries as “passionate,” “neurotic” and “giftedly non-diplomatic", Geffen has been a highly polarizing figure in the Entertainment industry. (For more on David Geffen and Neil Young, see FULL VIDEO: Inventing David Geffen | American Masters | PBS). Well here's something that we had forgotten about that's fascinating regarding Neil Young's Life album cover. Released on Geffen Records in 1987, the relationship between Neil Young and David Geffen was very strained -- to be put it mildly -- while a multi-million dollar lawsuit ensued over a record contract. So what other musician has so directly challenged his label and owner so openly with lyrics like: "We don't wanna be watered down, takin' orders from record company clowns." (Prisoners Of Rock And Roll)? In the fall of 1986, I had the opportunity to attend one of the shows in the Rusted Out Garage tour; in fact I saw the show that was broadcast live over pay-per-view television and on audio through participating radio stations. I had a heads-up about the audio broadcast and I was successfully able to set up my hi-fi vcr to record the audio portion of the concert while I attended the show. I had good copies of several new or unreleased songs several months before the album in which they appear would be released. I liked the new songs and anticipated the release of the next album; the first with Crazy Horse since re-ac-tor. The basic tracks on several of the songs were recorded live in concert on the ROG tour, then various overdubs were added in the studio, a technique Neil had used for Rust Never Sleeps. I found that for the most part, I liked the raw live versions I had from my radio recording much better than the final album tracks. Take Around The World, for example: I thought it was a good rockin’ tune live. The added spoken parts found on the album (not in my concert recording), you know the part that goes “hey, what’s that you’ve got on…” was IMHO superfluous and actually detracted from the effectiveness of the song for me. I do like most of the album overall though. Mideast Vacation is somewhat disturbing; “I was Rambo in the disco, I was shootin’ to the beat” creates an image that really bothers my peace and love sensibilities. A throwaway tune on the album, Prisoners Of Rock And Roll, has for some reason become a Neil Young and Crazy Horse staple. I’d rather see them perform Inca Queen or Around The World myself, but no one ever asks my opinion about Neil setlists… I didn’t know it at the time of release, but a couple of the songs were from a while before Life was released. Cryin’ Eyes dates back to 1977 when it was performed with the Ducks. While visiting the Rock Hall Of Fame in 1997 with a bunch of fellow crazy Rusties, I saw a lyric sheet for Long Walk Home that was dated in the early 70’s. Filling out the album was We Never Danced, a song Neil wrote for the movie Made In Heaven; the track was a collaboration with Jack Nitszche. I believe it had been quite some time since Neil had worked with him. I always liked this track, especially since the one in the movie features a female singer instead of Neil. Life was Neil’s fifth and last album of all-original music for Geffen records. The difficult relationship had come to an end. 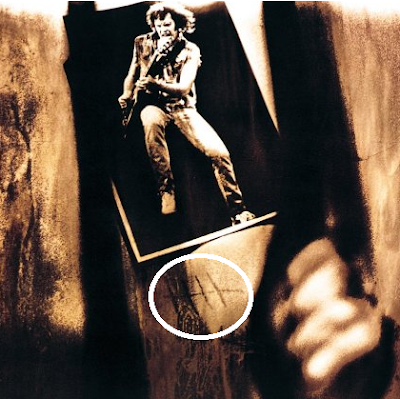 Check out the cover of the album and see Neil behind bars with the number 5 in hash marks visible. I think Neil was very glad to get back to Reprise and away from Geffen. 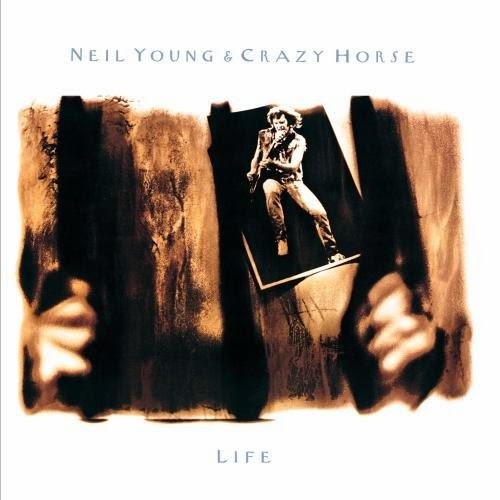 I don’t know what Neil thinks of this album, but I very much enjoyed listening to Life today. Life is Neil's last official recording with Geffen. It was released in 1987, with much of it recorded live during the Landing on Water tour. Although not as reliant on keyboards for its sound as Landing on Water, Life shares a certain feeling with its predecessor. Many of the songs, like "Mideast Vacation," "Around the World," "Too Lonely," "Prisoners of Rock'n'Roll," and "Cryin' Eyes," are rockers. They're fairly hard, and have some great guitar work. The remaining songs, "Long Walk Home," "Inca Queen," "When Your Lonely Heart Breaks," and "We Never Danced," are slow, melodic numbers. Most of the songs are about war, the Incas, rock, or love. One interesting thing is that the song "We Never Danced" was used as the basis for the movie "Made in Heaven," which stars Timothy Hutton and Kelli McGillis. Neil Young has a cameo role in the film as a truck driver. "We Never Danced" was unfortunately not sung by Neil in "Made in Heaven," but was used to good effect none the less. was. I disagree; real life is love, war, hate, rock-and-roll, etc., and that's what the album Life is about. Long may you run. For more, see Neil Young Discography. I saw the ROG Tour at the Cow Palace. I still watch the VHS copy I have. Its really really goofy at times. Fun stuff. Good show. I am going to enjoy the pro lobbyists for this stinker! It clunks along only saving grace is Mid-East vacation. Inca Queen wants to be Cortez Pt 2 and fails. I haven't played it for years and now look forward to all TWERS telling me how career defining it was and I can't be a real fan. Yeah, I agree, this was such a disappointment. I saw the ROG Tour is St. Louis and was so ready for these songs on an LP, and then when it came out I was like "what happened to these songs' balls?". I will stand by what I said in recent comments about Life. Not a big fan of the overall soundscape: excessively slick and plastic in places, and no real musical surprises. There are some solid songs, especially the first few and Cryin' Eyes. I can understand Prisoners of Rock 'n' Roll as a Crazy Horse anthem, but it is also a goofy throwaway. Long Walk Home is likely my favorite song on the record. It seems to be linked, melodically, to Slowly Burning, a Buffalo Springfield-era instrumental released on Archives I. I think the Archives set book has a different set of handwritten lyrics under this name. So I'm fairly certain it's one of those songs with a long history. Mideast Vacation is disturbing, but I think deliberately so. The final mix suffers from overproduction, but the song is interesting and worth listening to more than once. I believe both Mideast and Long Walk video clips were published on Neil's website during the Living with War period, and while the lyric does focus on the anger, confusion, and alienation felt by the first person narrator, I don't take it as Young himself warmongering. It's more a psychological portrait of someone who deployed to the Middle East and the impact it might have on that person. The biggest problem for me, musically, is that this record is supposed to have been recorded mostly on the Live from a Rusted Out Garage Tour, but it doesn't sound anything like a rusted out garage. If the "rusted out garage" sound had been more fully embraced on the album, it might have boosted even the lesser songs. As it is, the album suffers from overly shiny, sterile production that really doesn't fit with most of the material. Mideast Vacation especially suffers from this, with keyboard echoing, ill-defined guitar parts, and so on. tl/;dr: There some good songs but they're sometimes smothered underneath lifeless mixes. On the plus side, we are gradually working our way towards 1988-1991, probably my favourite period for live performance. You can probably hear me raving about the Ragged Glory tour already (again). The album Life is worth a listen (though probably not too many repeat listens). Then, once that is over with, skip This Notes For You and treat yourself to a main course of Bluenote Cafe, a far better record than either of the previous two. And it helps if you've got some good speakers with decent bass. You need to be able to feel this music, not just hear it. Reprise was dropping Neil because his sales were tanking, according to his manager in an interview he gave to Jimmy McDonough. I think it's page 554 in the "Gospel According to Jimmy." Geffen was offering a million dollars for each album. The problem arose when everyone on Geffen's new label was tanking, including Neil. So Neil was making money off albums that were not selling. It was naive of Geffen to give hand outs before the albums were ever made. He was trusting. He thought Neil would deliver. I think Neil is about as dialed in on everything as he's ever been in his writings for this album. He's point on and sarcastic, bombastic and melodic as hell. "When they burned me in effigy my vacation was compleeete'! That's as solid a lyric as he has ever written. And some vintage snarling vocal too. To me the ballad songs are as pure as any. We never danced!! And the industrial sounds and echos, it's 80's before 0 to 60. Pure revolution. @ SONY 'And the industrial sounds and echos, it's 80's before 0 to 60. Pure revolution' - I'm used to fans defending Neil's records here - but usually they make sense but what does this mean? Industrial Sounds and Echos? you mean badly produced? Hmm...I'm not surprised if Neil's sales were underwhelming around the time of Hawks and Reactor. That pair of albums is mostly directionless and not that interesting, excepting a few good songs. To be fair, my understanding is that Neil was fairly distracted from his art by his life at the time, figuring out how to care for Ben. Young, etc. Anyone with a special needs child can probably tell you how much time, energy, and other resources can be taken up making sure he/she is comfortable and secure. Whatever the reasons, an artist of Neil's productivity and longevity can be forgiven a few minor works along the way. I still say it's worthwhile just to highlight the forgotten albums now and then. On the subject of dwindling sales, word in the industry was that Warner Bros/Reprise were planning to not renew Neil's contract as late as 2004. Not coincidentally, this was followed by the release of a straightforward Greatest Hits album (something Young had declined to release up until that point). Then a middle-of-the-road (by Neil's standards) country album. And then the following year, a CSNY tour. Notice, too, how indifferent early indicators of ticket sales in 2015 were met with mammoth set-lists jam-packed with rarities and hits. The Monsanto pill coated in plenty of sugar. Early the next year, following Willie Nelson's lead, Neil played his first private big-money gig (that's giving a pass to the factory farm-sponsored early Farm Aid concerts, which although non-profit, ultimately benefited Tyson Foods more than anyone). Even great artists are beholden to whoever pays the bills. Which can lead to some compromise from time to time. That's part of being a professional. But that's also why when a rich guy comes along and offers to give you lots of money, it is sensible to pause for a second. There are occasions where NOT taking the quick money can be the sensible thing to do, because (as Neil once put it), "integrity finally pays off". But it takes time and commitment, it's an on-going thing, and respect lost is not easily regained. Again, it's not easy being successful. and ... to piggyback on Scots comments about talking the cash or not ... here's a bit of a slightly cyclical comment albeit not meant to be snarky but perhaps just realistic ... did the Dessert Trip shows finance this extended vacation from touring? For me, Landing on Water and Life were excessive retaliations to the lawsuit with Geffen which unfortunately ended up adding two records that most fans found frustrating. They are both angry, spiteful releases that do contain some good material smothered in 80's production and intentional finger pointing. I own both on vinyl and C.D. and can't remember the last time I played them before these recent discussions. The same goes for Fork in the Road which I found less than inspired although it does have a few gems. I'm along for the ride with Neil and willing to accept that he is not only an original creative force, but also a flawed human being, so although the road has had it's bumps along the way, I feel the good outweighs the bad and the brilliant is more common throughout his long career. I just got Peace Trail on vinyl yesterday and it sounds beautiful. This record is far more powerful on vinyl than C.D. so if you haven't got it on record yet and have a turntable I highly recommend the investment. It's the least expensive vinyl Neil has released this century. Dan1: take comfort from the fact that Neil disappeared for most of 1990 as well....and then released Ragged Glory! The same goes for Sleeps With Angels in 1994. And Prarie Wind in 2005 (certainly not one of my favourites like the other two, but a lot of people seem to like it). Hopefully he's just recharging his batteries, so to speak. I'm sure 2017 will see the release of something, either a new album or an archives release (maybe a Performance Series), if not both. As for the future of the Archives proper, like all of us I am looking forward to the next volume. At the same time, I'll believe it when I see it. As Briggs said: "Neil is the worst finisher in rock 'n' roll". I think Neil has clearly passed well into the over-thinking stage, constantly re-doing things to ever-dimishing returns, looking for the perfect format to release it in; not accepting that settling for "pretty damned good" is a more healthy alternative. You can hear on some of the Pono remasters how the original tapes have started to deteriorate since they were first transferred in the nineties. I thought Volume One was essentially fine as a physical release, and a blueprint worth continuing with. The music was presented beautifully, great sound, and even the clunky-interface of the blu-ray version was conducive to patiently savouring the experience. The only problem (and a big one at that) was that it was was not maintained as promised. You can only treat the customer with so much disrespect before they stop buying. Which poses a serious problem for this latest idea of an interactive "Archives website". The problem with complex websites is that they very quickly become obsolete, requiring almost constant maintenance. They do not stand the test of time. And the beauty of the seventies period is that the music is so strong it will speak for itself. A basic physical release with a good book, some rare photographs and a few accompanying hi-res visuals to provide some engaging context (like on blu-ray Vol 1) would be fine. Perhaps use a basic website to offer additional downloads. Beautifully simple and refreshingly straightforward. Anything more than that would be a pointless distraction from what really matters: the music. Just a few thoughts for anyone who might be listening. I'm listening Scotsman and agree - Archives 1 was over engineered in terms of the blu ray and monster box which set which was poorly packaged. I'm not convinced we will ever see Vol 2 - certainly not in the format of 1. Scots, good point on how Neil usually reappears in great form ... helps to remember that when things are so silent!! As in any artist catalog or archives, the gems are there and ready to inspire the next generation which is how Neil's brand stays afloat. The Geffen years can be summed up in many ways, but if it wasn't for Geffen's trust in Neil as an artist, Neil would have had a hard time convincing the beancounters to take him on. Neil had invested heavily in another movie production, model trains, and among other things he was facing bad press, lawsuit from Carrie and comments made by friends about him totally going off the rails. Sure, Geffen was an easy target for Neil when things weren't going his way, and the same can be said about Geffen. But, Geffen retracted the lawsuit when it was pointed out to him, by Neil's people, about the seriousness of Ben's condition. So maybe the Geffen years allowed Neil to take care of his family when his family needed him the most. Re: Neil going quiet for a few months, I am not too concerned. We know he's not touring this year, but if I remember rightly, he talked about continuing to have recording sessions, so I think we may well see a follow-up to Peace Trail within the year. We've also been hearing that he's planning to set time aside for the Archives, so there's that to look forward to if we're being really hopeful. And let's not forget, even major fans are forever telling Neil to take some time to develop better music, so if that's what's going on, it seems a bit contrarian to bemoan it now. Lastly, Neil does have a private life to attend to (new grandchild, Daryl Hannah, etc. ), so he could be taking time to sure up that side of things. I would imagine, given the recent series of events, that he wants to make sure he can maintain a good relationship with daughter Amber and the other kids, seeing as how he seems to have left Amber and Ben's mother. Incidentally, I know it's a private matter--but does anyone happen to know about the arrangements for Ben Young's care these days? It would be a major concern for parents who are A)Not together any longer and B)Not getting any younger, and even if it's none of our business, we all know we can't help being curious. @Andy--I have to ask, have we disappointed you by having some honest, critical discussion about Life (and LOW)? Pegi has said in several interviews that Ben is living on the ranch. The gig Neil played in Rome in April 1987 was great. The new material sounded much better live than on record. Highlights were Long walk home, Inca queen and mideast vacation. At the end of hey hey my my he almost destroyed the guitar!!!! They played really loud. @ Ian no it's been a good honest set of opinions - It's led me to playing them again and I'll stand by my comments they are very low points although I admire everyone's stoic defence BUT they are both clunkers. Interesting someone at last mentioned Ms Hannah - there's an album there surely look at the songs Jackson Browne wrote. For all of the discussion over these overlooked albums from the 80's, I've always enjoyed the sampler of these records, Lucky Thirteen. It's eclectic, but that's part of the charm, and truth be told, I've spun that album more than some of Neil's more noteworthy albums. And the fact that it doesn't spend too much time with any one album works to its benefit, as the stale 80's production on the LOW and Life tracks doesn't hand around long enough to wear out its welcome. Additionally, two previously unreleased Shocking Pinks tracks are pretty good and suggest that a live album with that lineup might have been a better choice. Good point Bill. I shall have to give it another listen. Lucky Thirteen was originally noteworthy for being the only place to hear a brief teaser of Bluenote Cafe. If I recall, the mastering on the Lucky Thirteen versions of those blues songs is more spacious and relaxed, whereas Bluenote Cafe as released is more compressed, punchy and in your face (more modern, in other words). My gut instinct is that the 2015 version simulates the "wall of sound" better. But I shall have to listen again to confirm. Long Walk Home was an After Gold Rush 's outtake, but strangely it wasn't on Archives Vol. 1. This is weird because there was a relative lack of unreleased tracks from the After Gold Rush sessions on The Archives Vol. 1 set. So also the reason for this omission is a bit puzzling, if you also consider, for example, the presence of largely early known demos like the Elektra Demos in the released tracklist. In the Geffen's years Neil was clearly angry with his label management, but it isn't true that some records were simply retaliatory moves as also Neil pointed and justified later. The songs from Everybody 's Rocking album were massively present in the tour set lists and Neil was mainly making money from the live shows. This would show that Neil was clearly in these projects. Also the Life's songs were largely present in three tours in 1986-1987. Andrea: Is there evidence that a recorded version of this ATGR-era Long Walk Home actually exists on tape? I'm inclined to think that if it existed it would have been referenced in some form on Archives Vol 1. It's interesting. My guess is that Long Walk Home was just a partially-finished lyric in 1970, staying unfinished and unrecorded until 1986. Just like "Big Waves", another "song" from 1970 that was in reality just a lyric fragment, eventually being fleshed out years later into the much more familiar "Powderfinger". It could be Willie's health is in question. And the boys are staying close to home. I hope to hell that's not the case. Great comments here by the way! @ All - lots of insightful comments again on these 80s Geffen releases. Great stuff folks! @ - ROG Tour at the Cow Palace definitely an excellent slice. The Bill Graham and Sam Kinnson stuff is pretty amazing and glad it was recorded. This is where Graham coined the phrase "3rd Best Garage Band". Name #1 & #2. @ Andy - here's the deal .... again. "Stinker & clunks" doesn't cut it. Criticism without reason and logic will be dismissed by the astute NY fan. See Ian's comments above. That's how its done. No cheap shots. Mid-East Vacation is more than a saving grace ... it was prophetic. @ Acoustic FeedBack - that always seems to be the case w/ Neil -- the reverse for most artists where the live concert vastly exceeds the studio output. As we all know, LMIB. @ Ian - Hmmm, recorded mostly on the Live from a Rusted Out Garage Tour? Really? Never knew that. Your right, it sure doesn't sound like it. @ bob - dudek - lots of Neil flavors out there. Scotsman - you're quite the fan of Bluenote Cafe. Thanks for bringing this up because it definitely got lost in the shuffle a few years back. Mother Nature on the Run - We don't think Geffen has ever been described as "naive". He's one of the shrewdest operators in the biz. @ SONY - we understood your comment. @ Dan1 - no apologies necessary especially when Neil is on sabbatical. It's all good. @ Dan S. - Glad you're enjoying Peace Trail on vinyl. Maybe Neil heard some of price complaints on the vinyl releases? @ joe lookout - see comment above about live & studio. Altho still trying to verify the comment that Life is a live recording? @ Bill - Lucky Thirteen was sort of an oddity release. Definitely eclectic. Recorded the live WXRT radio Chicago broadcast of the Nov 21 1986 ROG Cow Palace simulcast on cassette. Have listened to this innumerable times. As the Westwood One Announcer says "The show rocks, it does rock". Dan Clear is the host for the show and takes us backstage. Neil's mother calls in during the show to say the exterminators are coming. A grandmotherly neighbor bakes some zucchini bread for the guys. Comedian Sam Kinison calls the police and appears a couple times as an irate neighbor. The dog Elvis is heard barking while the boys are "practicing". It's all a lot of fun. The cassette tape was blessed. It lasted for thirty years and has now been digitized onto Pono. @Thrasher--I decided to dig a little bit about when/where "Life" was recorded. Consulting the Bible According to Jimmy, pg. 610-613 elaborate on the Live from a Rusted Out Garage Tour of late 1986, which supported LOW. This is the same tour to yield the as yet unreleased film "Muddy Track"--the tour with the giant cockroaches and all the theatrical trimming Grey Rider mentions. Briggs was brought, along with Niko Bolas as engineer, to create an album from the tour. Polishing was apparently done in post-production. Shakey does not mention exact dates, but Wiki cites a book called Ghosts on the Road: Neil Young in Concert 1961-2006, by Pete Long. I have not read this book, but if the citation is accurate, it gives us dates of November 18 and 19, 1986, live in concert at the Universal Amphitheater in Universal City, CA, as the source for most of the album. I was pretty certain I had read about this, but wanted to double-check myself so as to avoid spreading inaccurate information. I thought it was possible I had confused tours, but looks like not. @Scotsman--You and I seem to think alike on Prairie Wind. I've always found it somewhat overrated, possibly bolstered by the popular (and not necessarily untruthful) narrative at the time about the twin setbacks of Scott Young's death and the aneurysm/surgery motivating the project. People wanted to see Neil overcome his traumas in any way, shape, or form, and after the critical illness, there was jubilation just to have him back in the saddle. I have always liked The Painter, and When God Made Me is as powerful and complete a statement in song as Neil has made, but some of the others resonate less with me. It's not a bad record, but I've always found some of the accolades in excess. I actually feel that CDII may hold up better overall as an album, benefiting from its more eclectic sound and consistent songwriting. I'd consider No Hidden Path to be one of the defining songs for post-Y2K Young. Along with Spirit Road, it amply fills the quota for grungy works out with Old Black. Ever After and Beautiful Bluebird (the latter of which fits perfectly with these songs, despite dating from the early '80s) are two gorgeous country-tinged numbers that avoid some of the excesses of Prairie Wind's lush sound. And there are a couple of numbers, namely Shining Light and The Way, that I find to be quite underrated. Some may think they're quirky novelties--a bit goofy even--but I find them sublime in a way that has been unique to Neil's work. Other examples would be My Heart and A Dream that Can Last, the framing songs on SWA. They are spiritual, as is CDII (by Young's own account), and to me there is a certain resemblance between the softer moments of these two albums. In the case of CDII, it all holds together so well that the inclusion of Ordinary People is almost icing on the cake of an already otherwise complete work. @Bill Bonney--I see eclecticism as a good thing. Keeps art and life fresh and interesting. CDII is, for me, a prime example of this principle in operation. @ TW my apologies for using such brevity as I can see some of the depth fans come here to defend the music. For me music cannot be described in words it's best left to the listener. As one of the older fans on this site perhaps I look at Neil's music differently and certainly not as verbally equipped as some of the other visitors here. For me it's simple put the record on and it either engages me or not. Neil's music has followed me since 1970 so I understand the man and his rather unpredictable nature but I look at all the albums and they recall years gone by but the recent releases do nothing for me and LOW & LIFE are brief interludes in a stellar career that now appears to be in the twilight. His place has been taken by the likes of James McMurtry & Dave Alvin. Express your opinion without regard to what anyone thinks (even and especially) Thrasher. And, as long as you avoid ad hominem attacks, NO one can legitimately attack your opinion, because it's yours. @Andy, In the 80s, we witnessed how process played out in public and impacted the product. What you're describing is how his fans respond to both the process he undergoes and his product. I am sentimental and nostalgic. "Re Actor" and the Geffen label products have a place in my heart because of the process Neil underwent to get there. Are they listenable? Sometimes they are and sometimes not. It depends on what kind of mood I'm in. I have no more expectations from Neil because he already created his masterpiece in my mind. If Dylan never did anything after "Blood On the Tracks," I would still be listening to "Blood on the Tracks." That fact that he continues to tour and produce is something to celebrate each and every time. "When Geffen first heard the record, it didn't have any of the vocoder stuff - it was all the Hawaiian stuff, and Geffen thought it was okay, but he didn't think it was good enough. "Neil, you can do-more with these songs - keep going." It was healthy what we was telling me, but instead of going forward, I went back - to all the stuff that had been buried. I really did Trans stuff at the end of Warner Brothers, not at the beginning of Geffen.'" ` Neil Young, "Gospel According to Jimmy, A Voice No One Could Recognize." Industrial is a style of electronic music from the late 70s. It was like punk in that it was DIY, anti-establishment and tried to push straight society's buttons. The name was a joke, music seen as a purely industrial process where the product was pumped out on a yearly basis. It all goes back to the band Throbbing Gristle who released all their music on their own label, Industrial Records (their slogan was Industrial Music for Industrial People). They were one of the first groups to use samplers and designed pretty much all their own electronics and as part of the routine they only played for exactly 60 minutes at gigs (even bringing a card punch machine to one gig so they could clock in and out) and releasing lots of paperwork underscoring the industrial satire. The music is an acquired taste, none of them were musicians (one was a glamour model/stripper, one was an electronics nut and one was a graphics designer who was a partner and Hipgnosis and designed sleeves for Led Zeppelin, Pink Floyd, etc.). The music is atonal and deliberately in your face, making punk sound like kittens in comparison. In later years, industrial as a genre was less about this style of deeply political and experimental approach to music and was applied to rock music that had an electronic element. Bands like Nine Inch Nails, Marilyn Manson, Ministry and Rammstein come to mind. I guess this is where the reference is coming from, the drum machine sounds on LoW do have a cold, clinical sound that is synonymous with the genre. Long Walk Home is in a tracklist for a planned live-studio album (early 1970) and in a late tracklist for After The Gold Rush, so I think that everything is possible and this song wasn't mentioned in the Archives book as See The Sky About To Rain from the Harvest sessions and a few of other songs. @ Andrea del Bianco: Unless Neil changed the lyrics of the song, Long walk home and Mideast vacation are clearly referring to what was going on in the Middle East, particularly in Beirut, during that period. In October 1983 terrorists killed in Beirut more than 250 US soldiers and about 50 french soldiers in two different attacks (Trucks with explosive). It is hard to think Neil wrote that during ATGR era (1970 circa). It's possible that Long Walk Home is a different name for Slowly Burning (1967). The demo of Letter from Nam (1972) was maybe the first version with vocals, before the final master (1986). @So Tired - Good to see you our friend. Interesting on LWH being a ATGR outtake. You're right, it would seem that it would have been on Archives Vol. 1. Maybe incomplete or quality issues? And good point on Everybody 's Rocking and Life songs being heavy on setlists during tours. @ Arthur - a theory that we hope doesn't come to pass soon. We hear Willie is doing better, but slowing down. @ Grey Rider - yep, lots of fun. Dan Clear was pretty funny and did an interview awhile back commenting that it was one of his wildest professional experiences of his career. @ Ian - thanks on research. We have Ghosts on the Road and it is definitive and exhaustive. Sounds like things line up. @ Andy - apologies accepted and appreciate the context for some of your comments here. @ John - thanks on the background on "Industrial", definitely an acquired taste. Guess we never quite picked up on the satire angle but makes a lot of sense. @ joe lookout - thanks on history rundown. That helps. @ So Tired - wow, on Slowly Burning (1967) and demo of Letter from Nam (1972). You're definitely a Neil scholar!